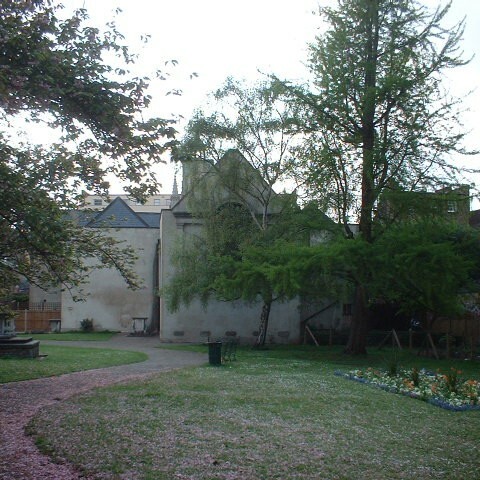 The churchyard was handed over to the Vestry of Bermondsey in 1882, and is now cared for by the London Borough of Southwark. The church has a number of external memorials, many of which are listed structures. Most of these are in the churchyard which was conveyed to the Vestry of Bermondsey in May 1882, and is now in the care of the London Borough of Southwark. Details of these, including photographs, can be found on www.imagesofengland.org.uk (which requires free registration). See also the note at the bottom of this page about 18th C tombs. The most noteworthy memorial which is not listed is on the wall at the south-west corner of the church (through the wrought iron rectory gates). It is in memory of Susanna Wood “who after a long and painful illness which she bore with the greatest fortitude departed this life the 16th of June 1810 in the 58th year of her age. She was tapped 97 times and had 461 gallons of water taken from her without ever lamenting her case or fearing the operation”. DEDICATION STELE. This records the assumption of responsibility for the care of the churchyard by the Vestry of Bermondsey in 1882. DRINKING FOUNTAIN with canopy, dated 1902, in Gothic Revival style. Given by Col S B Bevington, first Mayor of Bermondsey, in memory of his father. Limestone and pink and grey granite. HARRISON FAMILY CHEST TOMB. An Egyptian-styled tomb chest, 1851, in limestone, with badly weathered inscription. Situated close to the Dedication Stele. CHEST TOMB, c1815. Spearhead railings (currently in distinctive red oxide! ), situated close to the Dedication Stele. TABLE TOMB, near entrance to churchyard from Bermondsey Street, 18th C. In original railings on a stone base. CHEST TOMB, approx 15m south-east of the church, 18th C, in stone and brick. No inscription visible. GATES AND GATE PIERS. Metal gates and stone gate piers at entrance to churchyard from Tower Bridge Road. Early 19th C with spearhead railings. WATCH HOUSE on corner of Abbey Street and Bermondsey Street, early 19th C. Inscribed “The Gift of Henry Sterry Esq” which appears to relate to the attached drinking fountain. In the church-yard are the tombs of the following persons: Capt. Charles Smith, who died in 1726; Mr. John Burgoyne, 1728; and Humphrey Burgoyne, Esq. (1735); William Wilkin, Gent. of the Great Lodge near Tunbridge, (1735); Mary, relict of Captain William Studholm, (1738); Captain Charles Chamberlain, (1740); Captain Robert Nowne, (1741); Captain John Blackabee, (1750); Captain James Thompson, (1753); Sir William Richardson, Knt. (1769); John Brett, Surgeon, (1769); Capt. John Lindsey, (1774); John Bickham, Gent. of Co. Somerset, (1774); Captain William Sparks, (1782); Elizabeth, wife of Capt. William Compton, (1782); Joseph Phillipson, General Accomptant of the Excise, (1782); Capt. Samuel Haycraft, (1785); Samuel Bowerman, Esq. (1787); Capt. Enoch Stickney, (1788); Thomas Lechmere, son of Richard Lechmere, Esq. of Newborn Hall, Suffolk, (1788); Mr. Richard Phillips, (1789); and Capt. George Butler, of Rotherhithe, and several of his children (no date). 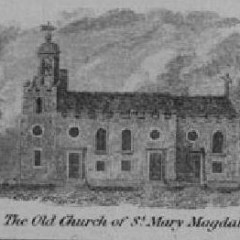 This entry is dated 1802-1804, by the reference elsewhere to the rector, Henry Mason.